Today we turn the spotlight on another skulk member and sometime werewolf, Kim Bannerman. Kim was recently interviewed over at Damien Seaman’s writing blog, it’s a good in depth interview and well worth a read. 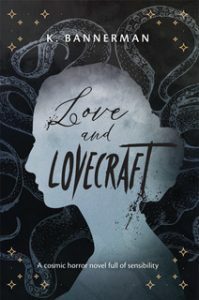 There is also an in depth review of Kim’s latest novel, an Austen inspired tentacle romance, ‘Love & Lovecraft‘. Here … Continue reading "Christmas Countdown Day 20"